Cuarzo is a Manuel Veiga bred Lusitano stallion, with a temperament that is totally unique. 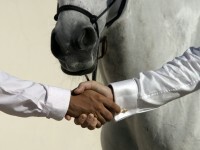 He is the most solid horse that we have in the HoofbeatZ™ stable and this shows in his unflappable nature and calmness. Cuarzo is a reliable, patient, honest and hard working horse and this is the reason that he is often chosen for performances in the Al Saheel show or corporate events. Cuarzo was nothing special until Luis Miguel Santos arrived at HoofbeatZ™ and worked his magic on him. Under the right hands this horse, with his precise movements, excellent breeding and good work ethic has really blossomed. The partnership between Luis and Cuarzo was put to the ultimate test in the UAE dressage competitions and Cuarzo was placed in the top three each time. Cuarzo is a gentleman stallion, with excellent manners. He is always well behaved, respectful of the people and other horses around him. Whether he takes a young teenager with little experience on a hack or a top rider through the dressage repertoire, Cuarzo is a horse that will deliver every time with minimum fuss and with a silent assurance that he will always keep the rider safe. Euwe This stunning Friesian stallion is one of the principal stars of the Al Saheel show, a HoofbeatZ™ production. He has incredible presence, style, good looks and oozes charisma. His HoofbeatZ™ debut was in the first Al Saheel show, Voice of the Horse, where he was visually stunning but by no means the star of the show. When A 1001 Horse Tales, the revised Al Saheel show, was launched, Eileen Verdieck took this black beauty under her own supervision and skillfully showed just what he was capable of. His elevated rears, his passage, his presence were suddenly there for all to see and admire. His popularity was such thatwe launched his own facebook page for fans. Once, when we reported that he had a minor cough, one fan turned up with pure mountain honey for this stunning stallion. Euwe has an extraordinary ability to draw people to him; he is utterly captivating. He is also a very gentle stallion with excellent manners and he treats all his visitors with an engaging ‘hello’ greeting. He notices every little thing in the arena from the music to the audience and his performance is always impeccable. His bond with Eileen is wonderful to watch, especially when in liberty (free) when he shows his true character and we get more of an insight into why he is such a well-loved horse. Euwe’s well-rounded talents make him a very versatile horse, as happy doing high school dressage as he is in liberty – and his capriole is spectacular. Thanks to his sleek good looks, he is also perhaps the most photographed horse in the HoofbeatZ™ stable. Germano, similar to the Spanish meaning ‘brother’, is a 13-year old gelding with an amazing work ethic. A dignified and hard-working horse with good moevement, he is not showy like some of the other Spanish horses. He has a gentle, sensitive nature and will return love and affection warmly. Germano carries himself well in the show, from his punchy movements, to his lavad and has great stage presence. He is dependable and could probably do most of the acts in the show without a problem. Germano is an honest and loyal horse who grows on you; the more time you spend with him the closer you want to be to him. Riders and performers who have had the pleasure of working with Germano all find they are infected by his graceful love and his giving nature. Yes he can be sensitive to changes, but with love and care he will always remain calm and centered. He works well with other horses and in the same measure stands out on his own. Germano lives up to his name being a true brother to his fellow horses and his riders, showing love and loyalty. Gordy is a nine-year old Falabella stallion and is quite a character in his own right. He was a gift to HoofbeatZ™, along with three other Falabellas, from Jennifer Jennings on behalf of the stud farm she works for. Gordy’s cuteness alone can explain his great popularity but there is much more than looks to this very intelligent miniature stallion. Gordy has attitude and you can spell that with a capital A. In essence he ‘decides’ how he wants his act to go, and his relationship with Eileen is sweet, loving, and highly amusing to watch. Eileen in her illustrious career has handled some pretty strong stallions, but the challenge Gordy poses is not physical strength but strength of mind. He figures everything out ten times faster than horses and we suspect about ten times faster than humans too. During the show stable tours, and the breakfast tours it is no surprise he is one of the horses people want to meet the most. When he enters the performance arena solo the ‘Ooh’s and ‘Aah’s of the audience are overwhelming. Gordy has serious stage presence and he knows how to work an audience; if he finds them appreciative he will perform to Oscar standards, and guess what, if he finds them dull he will give them what he thinks they deserve. His performance overall is impeccable, his charm infectious and as he saunters through the audience he knows full well that the spotlight is on him. This horse is undoubtedly the star of the show and he knows it. Postinero is an 11-year old grey Andalusian with a wonderful disposition. He is a left-brain introvert and very chilled, some would argue too chilled. He was given to HoofbeatZ™by His Highness Sheikh Mohammed Bin Rashid Al Maktoum’s Horse Retirement Stables, where the horses are extremely well cared for. Postinero has been with the HoofbeatZ™ team for close to three years. In September 2008, Anwer Sher learned basic natural horsemanship with him together with the expert help of Ingela Larson. Anwer and Postinero soon became firm friends and Postinero’s true potential began to show. Since then Postinero has positively blossomed and this horse has a new lease of life. He continues to accompany Anwer for the introduction to the Al Saheel show, but has expanded his role to include some trick riding, dressage and has even been ridden for horse archery, showing his great versatility. He is cute, curious, intelligent, chilled and most of all a great companion. Postinero, or Posti for short, is a special horse and much loved in the stable. Some would argue he is perhaps a little spoiled. But then what’s the harm in that? He is happy and so is the HoofbeatZ™ team.